The Dark Twin can be seen rising in the western sky from a webcam at the Neumayer Station on Antarctica. This station is at Latitude 60 so is two-thirds the way down from the Equator, not directly at the S Pole. The cam is pointed south, so one can only see the Sun rise as it shines on the North facing side of the station and cast shadows in front of the cam. The object captured is neither the Sun (which is behind the cam) nor the Moon (which is on the Ecliptic, and a nearly full Moon at the time). Thanks to Gordon Gianninoto for bringing this to my attention. Note that the object rises as the cam records 5:00 pm. At this point the rotation of the Earth has pointed the cam increasingly toward the West. The object then appears directly above the station 10:00 pm and is visible until 1:00 am. This places the Dark Twin more behind the Earth, and below the Earth having dropped below the Ecliptic, out in space rather than far to the West in their shared orbit. 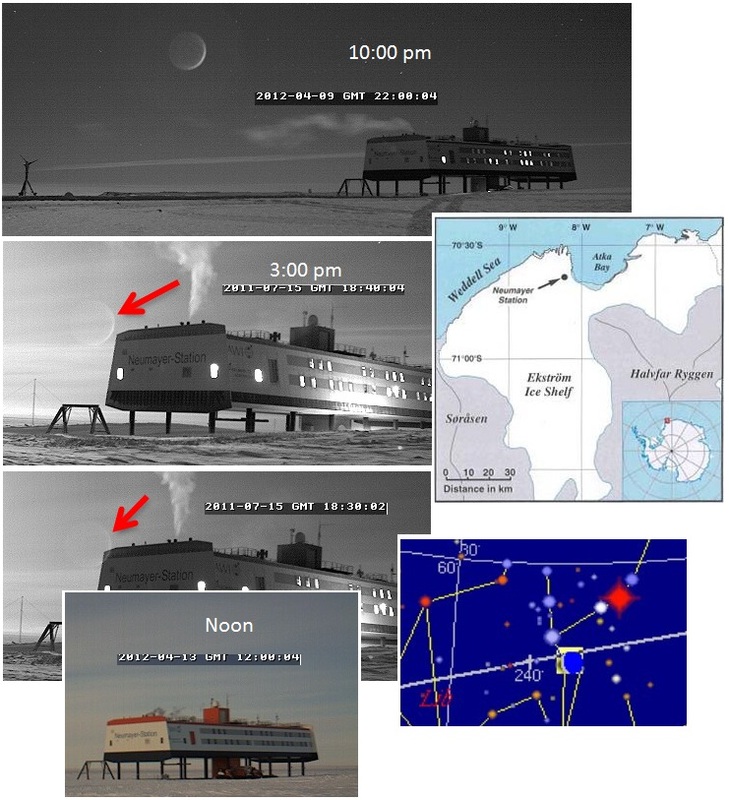 Per the Zetas, this Neumayer capture is indeed the Dark Twin. ZetaTalk Confirmation 4/14/2012: Clearly not the Moon (which was nearly Full and in any case behind the cam) nor the Sun (as the object appears in the middle of the night just before and after midnight), this is a capture of the Dark Twin. The cam is near the S Pole, looking at the North facing side of the structure, and as such the cam, or a human viewer, would be hanging upside down looking directly out into space on the dark side of Earth. Where the Dark Twin should be riding to the West, behind the Earth in their shared orbit, it appears to be almost overhead, directly behind and somewhat to the South of the Earth. We had warned that the twin would tend to move behind the Earth as these planets are squeezed in the cup, and thence escape by moving back into space behind the Earth, passing the Earth in their shared orbit. We mentioned these possibilities, that the Dark Twin would pass the Earth and attempt to escape by moving forward in their shared orbit. At present, the twin is caught behind the Earth in their shared orbit, and moving along outside of their orbit behind the Earth out in space. It is trying to evade conflict with the Earth by dropping below the Ecliptic somewhat, as it attempt to slide past the Earth. This movement had been predicted by the Zetas! 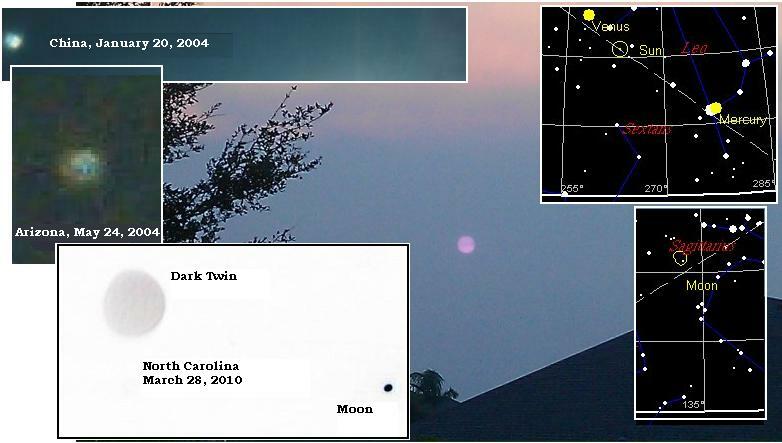 The Dark Twin was visible, and captured in photos, in January, 2004 as it came around from behind the Sun toward the Earth, which had halted in their shared orbit. It was visible as a blue/yellow object seen at dusk at that time. These were the colors seen naked eye by April, 2004 also, from observers around the world. New York City: I know that it was at least 3 times bigger than Venus has ever appeared. Possibly more. Obviously it was bigger than a normal star because I thought it was a light on a building. And the color also! That yellow was flaming yellow! Then two minutes later - blue! The map I pulled up for NYC shows that Venus is not visible at that time. I know it wasn´t Venus, but that´s about it. Why? Well, for one Mars and other objects were right next to Venus and the object I saw was off by itself just sort of hanging there. I was walking toward the West in NYC (West Side). NYC is skewed in terms of true directions. Going according to actual directions (by using where the Sun sets) I was walking NW. Detroit, Michigan: I live in suburban Detroit. I saw it in the sky around 11:00 PM. It was so huge I thought it might be an airplane coming in. Sydney, Australia: I see it every day slightly west NW. It is extremely bright as the Sun sets then reduces in magnitude to about the brightness of Sirius it does actually change color from yellow to blue then disappears below the horizon by about 9 PM. San Francisco, California: I saw it from about 9:30 to 10:30 my time the first night. I looked at a map and did not see Mars near it or any other visible stars, it seemed alone. I went out again at 11:00 and it had just disappeared, the night was clear and the earlier time I saw it , it wasn´t low enough on the horizon to have disappeared. The next night I checked it, it was still bigger and brighter than any star etc I have noticed before. But strangely, it seemed to have moved slightly more to the West. Indiana: I am in middle Indiana and I took the dog out and saw the huge yellow colored planet / star in the western sky. I didn´t stay huge yellow and low in the sky for more than maybe 10 minutes after I first spotted it. Phoeniz, Arizona: I´ve been seeing it here in Phoenix AZ over a week now. It is very obvious. It is due West in the western sky about 10:00 PM my time. Very bright, yellowish and the biggest star on the horizon. Then it was seen in the western sky, looking West at Dawn on March 28, 2010, as a Monster image. And later on September 7, 2011, now colored by the red dust in the atmosphere so it had a violet appearance. On July 31, 2010 it showed up on the Magnetic Simulator. The Dark Twin was, per the Zeta, to the West in their shared orbit and out behind the Earth in space at that time. In a crop circle analysis on May 14, 2011 the Zetas predicted that the Dark Twin will fall further behind the Earth as it attempts to escape the cup and more along in their shared orbit, perhaps even passing the Earth during these maneuvers. ZetaTalk Comment 5/14/2011: This design is clearly showing the Dark Twin during the passage. The Dark Twin is shown opposite the Earth, identified not only by being on the opposite side of the Sun but by the counterclockwise orbit direction that they both assume. We have mentioned that the Dark Twin is caught in the cup with the Earth and Venus, but that both will escape prior to the pole shift. We have also mentioned that the Dark Twin has moved outside of the orbit he shares with the Earth at this time, to escape the current crowding. In fact, the Dark Twin has been captured on film due to this drift outward. This crop circle diagram is showing the escape of the Dark Twin, which will escape in the manner depicted! 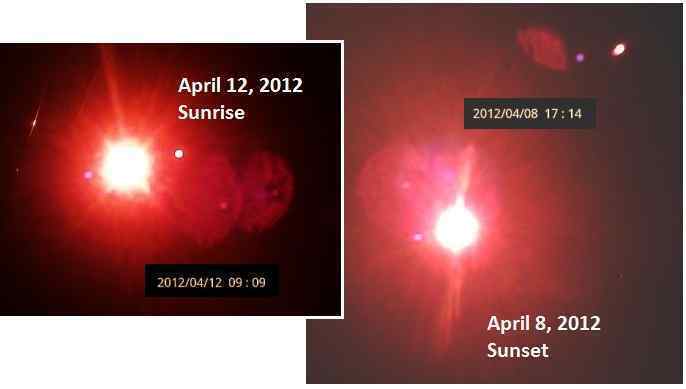 After moving directly behind the Earth as Planet X approaches, it will seem to disappear into the night sky. On April 11, 2012 the plate border between Sumatra and India slipped, per geologists, in a series of quakes in the magnitude 8 range, the original quake an 8.9. An earthquake with an initial magnitude of 8.9 has struck under the sea off Indonesia's northern Aceh province. 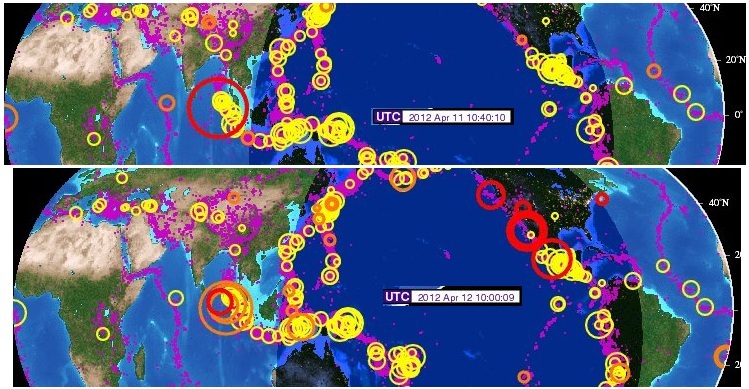 The quake triggered a tsunami warning across the Indian Ocean region. It was initially reported as 8.9 magnitude but was later revised down to 8.7 by the USGS. The tremor was felt as far away as Singapore, Thailand and India. As noted on a Pole Shift ning blog, quakes of high magnitude are on the increase, and the USGS is tasked with hiding this fact. Of the ten largest quakes of the last century, half have occurred in the last ten years, or since Planet X entered the solar system. And of course we can assume over the last ten years they have been downgraded by the USGS. It was immediately clear from the activity of the buoys on alert that a temporary void had opened up along the plate borders around Australia - to the north of Australia and just south of Tasmania. Buoy 56003 north of Australia showed a sudden 26 meter (78 feet) foot drop, and buoy 55015 south of Tasmania showed an even larger drop. In both cases the buoy plunged into a void, which quickly filled with water from all directions. No tsunami resulted as is the case if a plate lifts, displacing water in one direction, as was the case during the December 26, 2004 tsunami. 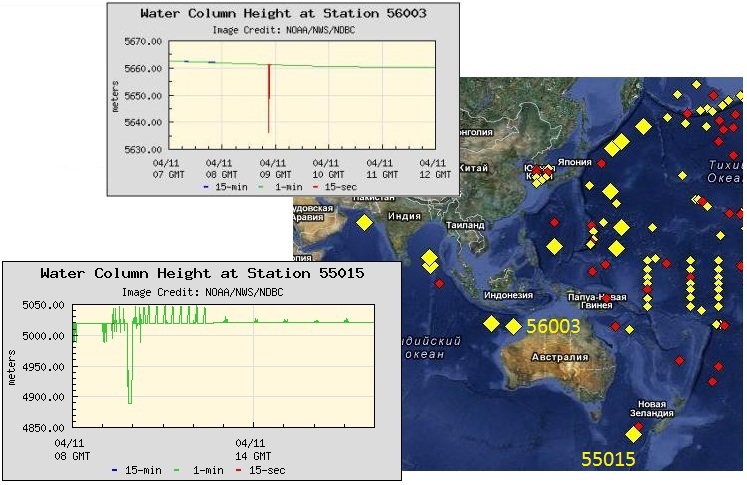 What was also immediately apparent was that the buoys were on alert outlining the Mariana Plate, and west of India along the plate border there, and up past Japan along the border with the Pacific plate. By the next day it was clear from the IRIS chart that the plates across the Pacific were on the move too, pulling Mexico and the West Coast of the US further west. This was clearly not a local affair! Per the Zetas, the plates were on the move. 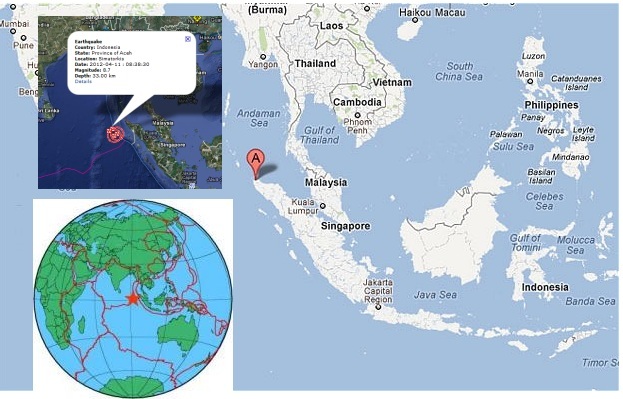 ZetaTalk Comment 4/14/2012: What occurred during the Sumatra quake was a shifting to the west of the plate holding India, such that there were those small voids along the plate border with Sumatra announced by the buoys. This does indeed relate to the crack occurring just days before along the suspension bridge up in the Himalayas along the Thailand/India border. Africa had been edging to the west also, as the Atlantic spread, and this allowed the plate holding India to make this move. During this adjustment, any snags holding the folding Mariana Plate back were eased, and both the Mariana and Philippine plates gave in to the pressure from the Pacific. This allowed the southern part of the N American bow to shift further west also. Did we not predict that the spreading Atlantic would allow a dropping and twisting Africa to fall into the increasing void in the Indian Ocean? Did we not predict that Mariana and Philippine plates would tilt and fold during the 7 of 10 scenarios? Why else are the buoys in that region on alert, so far from the slip-slide to the west of Sumatra? Did we not predict that the N American continent would tighten into a bow as the 7 of 10 plate adjustments proceeded? Here we have the entire West Coast from Vancouver to Acapulco suddenly having significant quakes. We stated the plates had been loosened, and were on the move. Our 7 of 10 predictions have become a fact. 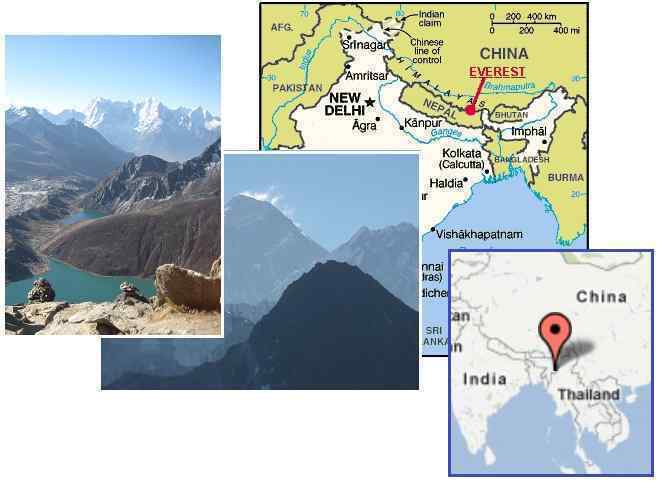 Indeed, the fact that the plate holding India was being pushed emerged when high in the Himalayas smoking cracks appeared, along the northeastern border between India and Thailand. This is indeed where the Himalayas push, as Mount Everest is nearby. A crack around 60 feet long and one foot wide developed near the suspension bridge which connects Thanga Samukon and Oinam on Samukon side three days back. The crack has been churning out smoke continuously. ZetaTalk Comment 4/14/2012: This suspension bridge is high in the Himalayas, and where it is experiencing mountain building it is not forming a volcano. What then causes smoke to come out of the crevasse so high in the Himalayas? There is pressure on rock strata, before it snaps. Pressure releases heat, and heat will vaporize anything that is not becoming molten. This is a temporary state, and can occur, as this episode shows, in the highest mountains, and at a great distance from the molten magma that constitutes the stuff of volcanic eruptions. Many people are having problems locating an old floppy disc. They can be ordered online or via eBay. Where other filters such as a welders lens can filter sunlight out, the floppy disc insert works the best because it is guaranteed to filter for red. A red plastic sheet will not do it, it is merely colored red. The insert in a floppy disc is in the very center, in this diagram it is the “Magnetic Disc”. Per instructions on this Pole Shift ning blog, you must remove the very inner dark plastic. What you need is to take your 3 inch floppy and break it apart. Take out the think black colored foil that is inside. Look directly into a light through it, you'll see it is red/brown. This is the part that you need to put in front of your camera's lens and look thru it. All other parts of the floppy you can discard. Lately, the tail in Alberto’s photos has been curling around, first to the left, then up, and now to the right. Per the Zetas, this is to be expected as the tail has momentum and is drawn along the magnetic field lines of Planet X.
ZetaTalk Comment 4/14/2012: Planet X is coming at the Earth in a retrograde orbit, from the right hand side as viewed from the Northern Hemisphere. Thus normally the tail should be seen wafting over at the right hand side, but lately has for months been seen wafting toward the left. Why was this? The tail is charged, and coming from the N Pole of Planet X is charged with magnetons flowing from Planet X along the lines of its massive magnetic field. These lines curl around to re-enter at the S Pole of Planet X, but this flow is not even throughout the magnetic field of Planet X. A waft will continue, due to momentum, and if pulled in this direction, along that magnetic field line, will curl along that line – to the left in the view from Earth and up. A waft has more than momentum, it has a limited reach. If the tail waft were able to travel all the way along the magnetic field line to the S Pole of Planet X, it would seemingly disappear on the lower right hand side. 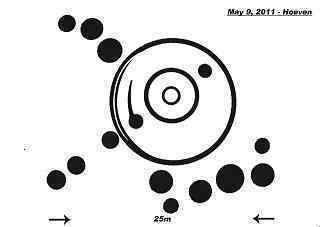 But, carried by momentum, it is forming a circle in front of the N Pole of Planet X. First to the left toward the S Pole of Earth, then up due to momentum, and round to the right! The Zetas have explained that Star Jelly, or Angel Hair, is air which has had its composition temporarily changed by electricity. This substance, if put in a closed jar, will return to its air state, seemingly disappearing. ZetaTalk Explanation 10/15/2011: Associated with meteor showers and UFOs, Angel Hair or Star Jelly is a temporary substance formulated from air particles. There is indeed a relationship to the electromagnetic fields generated by both meteors and UFOs. Many substances man is familiar with have different forms, such as water which can be steam, water, or ice. The jell of Angel Hair or Star Jelly is such a temporary structure of air, created when the various molecules have their external electron structure temporarily altered. Recently, on April 12, 2012 a huge green glop fell from the sky, an incident seen by both a motorist and a state trooper. Was this a UFO in distress? Per the Zetas, just another example of Star Jelly combined with the chemicals in the atmosphere from the wafting tail of Planet X. These cause Neon clouds. A slow burn can result, causing a glow. Light towers also are an atmospheric phenomena caused by the release of methane from shifting rock. Surprised by a green glowing whale falling from the sky? Get used to it, more is expected! The Republican-American of Waterbury reports that a person driving in Litchfield at about 2 a.m. reported that a green, glowing object the size of a whale fell from the sky and crashed into Bantam Lake. Officials say that at about the same time, a state trooper 10 miles away in Warren called dispatchers to report that something fell out of the sky and landed near Bantam or Morris. ZetaTalk Explanation 4/14/2012: What would be green, glowing, and plunging Earthward in the night sky? The tail is charged, so electrical fires can be created in the atmosphere. Neon clouds are likewise on the increased, and are caused by chemical reactions from the greasy tail of Planet X. The tail has oily component which can alight and produces a glowing cloud due to a slow burn. Then there are Light Towers which are as we have explained, caused by escaping methane gas produce. All these are recent phenomena due to the tail of Planet X, and will be on the increase as the tail increasingly engulfs the Earth during its wafting about. But water likewise can change form into more than ice and steam, apparently, as recent incidences of a bubbling milky white substance in water from Ontario to Wisconsin and over to Vancouver show. All these areas are on virtually the same latitude, stress in the rock at the same latitude in N America a common occurrence while the N American continent is forced into a bow. A mysterious substance is floating in the holding tanks of a pumping station. The substance was first noticed by a fisherman. This is a very milky white substance, kind of like between a petroleum smell and like a sulfur like smell. Sheldon Creek turned “milky white” after an unknown chemical spill was found in the waterway. The substance remains a mystery. Residents walking along the waterfront noticed the whitish-grey flow bubbling up from below. First responders were baffled. Per the Zetas, there is a simple explanation! Just as Star Jelly can form due to strong electrical current in the vicinity, temporarily changing the structure of air, a similar change can occur in water. ZetaTalk Explanation 4/14/2012: Two of these incidents occurred in a river or creek bed, and as we have explained these spots represent a thin place in the crust, so the crust sags and thus water pools there. In Vancouver, the milky substance bubbling up was in an inlet bay, in an area just east of the San Andreas fault line. Despite the assurances of those assigned to investigate and explain, no identification of the substance was done! So what is this substance? Just as the air itself can become solidified into Angel Hair on occasion, due to electrical changes in the particles holding the atoms together, this type of phenomena can occur in water too. Rock pressed close together allows electricity to flow via water trapped in the rock layers, and this moves electricity. Thus, temporarily, the water composition changed, making it appear milky and causing bubbles to emerge. Simple as that.